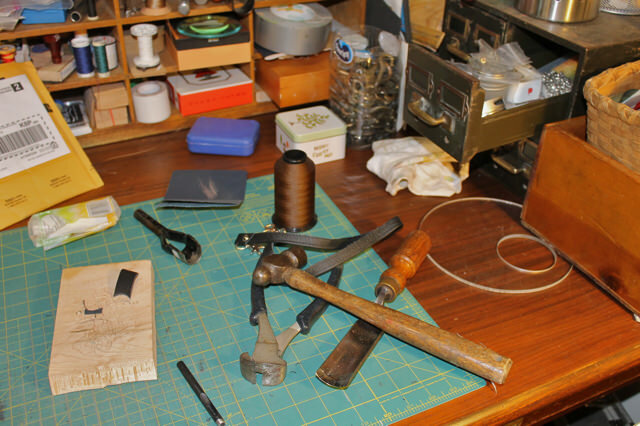 It’s a snowy day in my part of the world, a perfect day to burrow into the studio and get on with things. I snapped this photo of the counter with its pile of tools just as they lay there. Each bag requires lots of cutting and hammering. 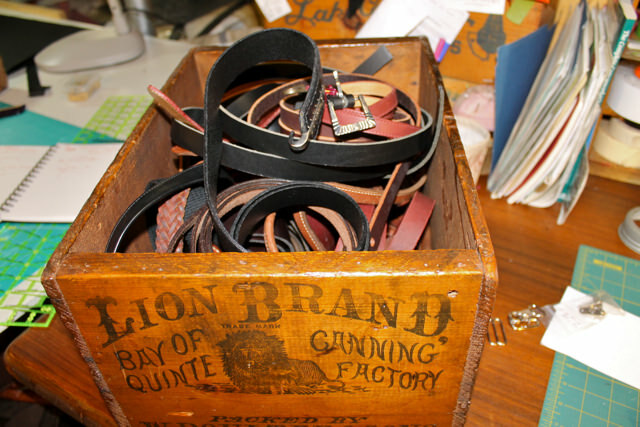 Below that is the box with my collection of leather belts. 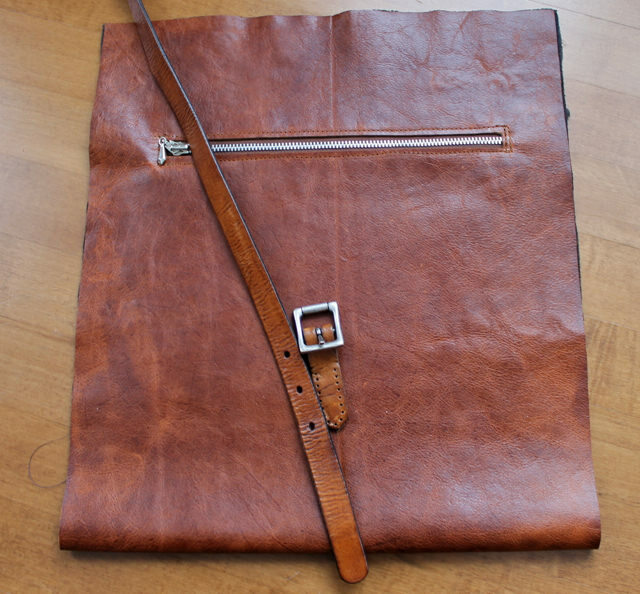 I really enjoy using hardware and leather straps from vintage belts on my new bags. Such additions are often much better quality than you can find now and add an interesting dimension. Here is a finished 1510 with its own unique leather strap. Below are two 1510 backpacks in process. 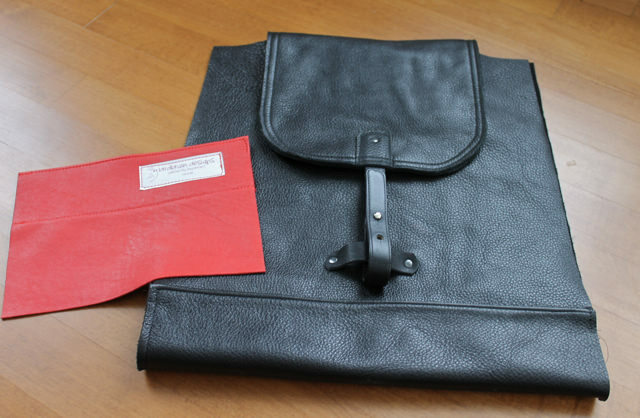 The first is a special order shown with a red leather pocket for the lining also repurposed, this time from a leather jacket I bought in Florence. It’s further along and I hope it will be done and in the mail this week. The cognac backpack below that is for the on-line store. Each backpack has a unique vintage closure. Look for the cognac 1510 in the on-line store by the weekend. Hi there from “not so sunny” Barbados. In fact, since we arrived on Tuesday, we have only had one sunny day. Good thing there are lots of them left. The downside is that I am nearly half finished the doodle moose project I brought with me. Oh well – brighter days ahead – and it isn’t snow. Laura’s bag is looking awesome! And the other one as well. Lucky soon-to-be owners out there. Great to hear from you, Wendie! It is very snowy here, so clouds or not, you are still ahead of the game. Thanks for the comment on the new bags. When you have such beautiful leather it makes sewing them a pleasure. I’m hoping to finish Laura’s shortly and get it off in the mail. Thank you for the sneak peek at your workspace. It makes me smile to see your space and your tools.